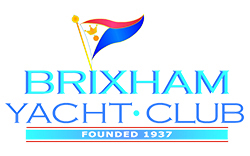 Brixham Yacht Club provides a range of facilities for visiting yachtsmen and sailors to enjoy when they take advantage of Brixham Harbour, and you are most welcome the Clubhouse for a drink and/or a meal with crew or friends. The Yacht Club maintains two visitor pontoons (not walk ashore) which are anchored a few metres from the club Steps. These can accommodate up to 4 vessels, each up to 40ft (12m). Smaller craft may raft up. For further information please refer to the Club Pontoons item on the menu to the right of this page. Berthing is also available alongside the Fish Dock wall nearest the Club at the same prices. Care must be taken, however, of the depth at low tide in the corner. The pontoons may be unavailable during Championships and similar events. A shuttle water taxi service is available during many events such as Yacht racing and regattas. Further information may be found on the menu to the right of this page. General information relating to the use of Brixham Harbour may also be found on the menu to the right of this page.